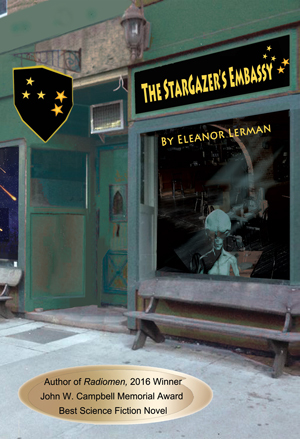 The Stargazer’s Embassy explores the frightening phenomenon of alien abduction from a different point of view: in this story, it is the aliens who seem fearful of Julia Glazer, the woman they seem increasingly desperate to make contact with. And they have reason to be: while Julia has had alien visitors in her life since childhood when her mother tried to "introduce" her to them, she has been violent whenever they come near. As an adult, with her mother long dead, Julia becomes involved with a psychiatrist who has been drawn into the alien abduction world; when he is murdered by a patient driven over the edge by her own abduction experiences, Julia nearly kills the alien who was also involved in the attack. Fast forward ten years and all alien abductions, everywhere, seem to have stopped. A journalist famous for writing about abductees and their experiences believes that Julia is somehow connected to this new phenomenon and threatens to draw her back into the public spotlight she fled from after the murder unless she helps him figure out what’s going on. Now, Julia will be forced to follow her mother's path, which in this life—and perhaps the next—leads deeper into direct alien contact and a confrontation about what death means to humans and aliens alike. I really liked this novel. It's wonderfully eerie, mysterious, captivating and thought-provoking. The story twists the experience of alien abduction, presenting the visitors or "things" as the main character, Julia, calls them or "travelers" as we learn they call themselves, as as bewildered of us humans as we are of them. They don't understand how to contact us any better than we know how to contact and experience them. And they are lost and lonely and reaching out. It's the style and the narrative voice that is so captivating and evocative. Eleanor Lerman writes in the first person, so the reader gets the story from a single perspective. That's a good way to craft a novel. It allows the author to control what the reader knows because the reader can only know what the main character knows. It also creates an authorial voice. The reader can "hear" the storyteller laying out the events of the plot and experience the story from the teller's perspective, along with the feelings and emotions and neurotic obsessions that go with the events. It makes the story more immediate. I've read Lerman's two previous novels, Janet Planet and Radioman. They are also written in that first person narrative style. They are also written in a kind of roman a clef style, with hints and references to real figures in recent history, but with different names in the story. With each novel, I was fooled into believing this was the real Eleanor Lerman. I believed she was one of Carlos Castenada's woman; I believed she knew L. Ron Hubbard. This time, I knew this was writing style. But I can't help but wonder if she really isn't an abductee or even a human-alien hybrid. Lerman adds new notions to the abduction phenomenon, like that they wear clothes, but have poor taste, that they have favorite humans, that they don't understand death, that they shadow certain people, like Julia Glazer, the protagonist narrator, that they like whisky. The clothing gimmick works within the novel to give personal identity to the various "things" Julia has met in her life; that's a novelistic technique to develop characters. That they have poor taste in assembling an outfit dramatizes the central conceit of the novel, that the aliens are having as hard a time understanding us as we are of understanding them. I got pulled into the story right away and thoroughly enjoyed the read. Highly recommended.